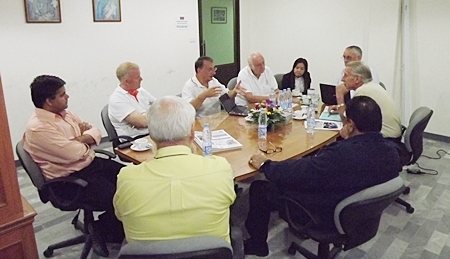 Members of the Pattaya Relief Group met at the offices of Securitas Thailand on Monday November 7 to make reports on relief efforts carried out by the group in the past week. 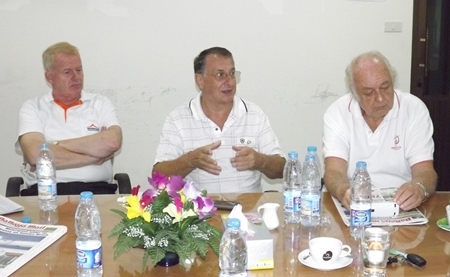 Steve Graham, MD of Securitas, reported that members of his staff delivered 500 bags of relief supplies to flood victims in Ayutthaya on October 31. 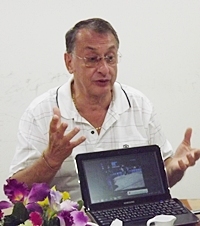 (Pattaya Mail November 11). In addition, on November 1, the company presented 7,500 liters of water to Sinchai Wattanasartsathorn, vice president of the Sawang Boriboon Thammasathan Foundation to be delivered to officials in Bangkruay, Nonthaburi after receiving a report of drinking water shortages. 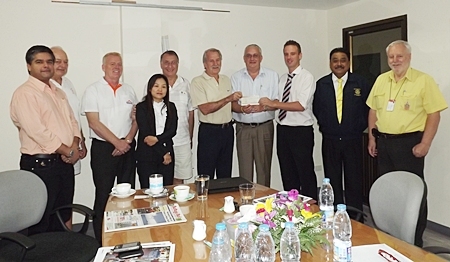 Steve Graham (4th right) MD of Securitas Thailand is flanked by William Macy (Pattaya Sports Club) and Andrew Emerey (St Andrews International School) who contributed 50,000 baht and 100,000 baht respectively towards the Pattaya Relief Fund. 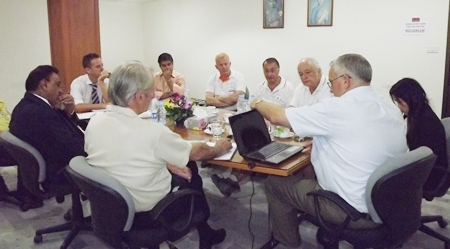 Members of the Pattaya Relief Group are (l-r) Tony Malhotra, Ferenc Fricsay, Gudmund Eiksund, Rungarun Harnnarong, Carl Dysin, Peter Malhotra and John Cole. In attendance at the meeting were Andrew Emery representing St Andrews International School who made a donation of 100,000 baht which had been collected on November 3, through a fund raising event organized by the children to help flood victims. William Macey, the charity chairman of the Pattaya Sports Club donated a sum of 50,000 baht, whilst David Kerridge presented a donation of 106,000 baht which was raised at a charity event organized for this purpose at the Café Royale. President Carl Dyson speaks about the highly effective Gravity Drip Water Filters. 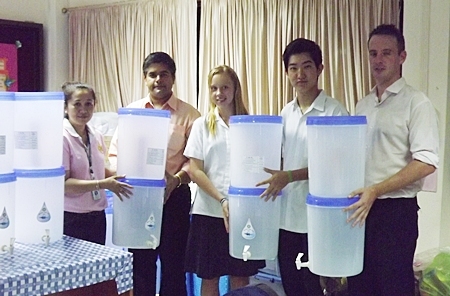 Gudmund Eiksund, president of the Rotary Club of Jomtien-Pattaya reported that in addition to the 200,000 baht contribution to the Pattaya Relief fund, the club had also donated another 50,000 baht to the Rotary Club Eastern Seaboard to help finance the purchase and assembly of the Gravity Drip Water Filters. 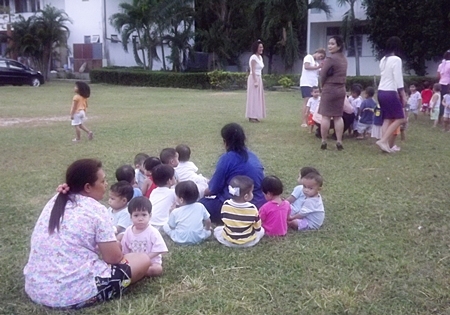 The babies are now safe in their temporary home at HRH Princess Maha Chakri Sirindhorn Vocational School in Banglamung. Tony Malhotra then proposed that the PRG with the assistance of the Rotary Club Eastern Seaboard donate 20 of the Gravity Drip Filters to the HRH Princess Maha Chakri Sirindhorn Vocational School in Banglamung which was now a temporary home for 248 children who had been evacuated from the Rangsit Babies Home which was inundated by the severe flood. In addition, Tony said that the children were evacuated in a hurry and therefore had no extra clothing with them and that they needed clothes and blankets to keep warm. Carl again came to the rescue saying that the Rotary Club Eastern Seaboard had a project called ‘Wrap up a child’ and that they had a few hundred blankets available for immediate distribution. He explained that this project was set up with the help of hoteliers and airlines, with Swiss International Airlines at the fore supplying blankets which were once used on their airplanes. 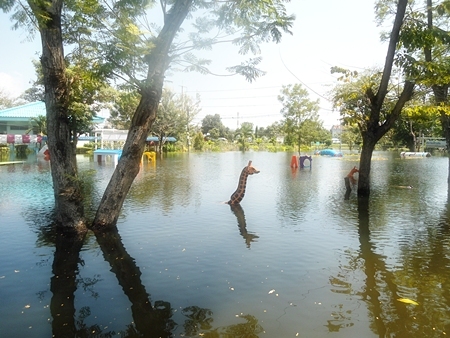 The water at the inundated playground at the Rangsit Babies Home reached alarmingly high levels. The next day Tony Malhotra and Andrew Emery delivered the relief goods to Pinya Jumroonsan, the kind hearted caretaker of the children temporarily seeking refuge at the HRH Princess Maha Chakri Sirindhorn Vocational School in Banglamung. They included 20 Gravity Drip Water Filters, 180 blankets, 100 bars of soap and 100 tubes of toothpaste. 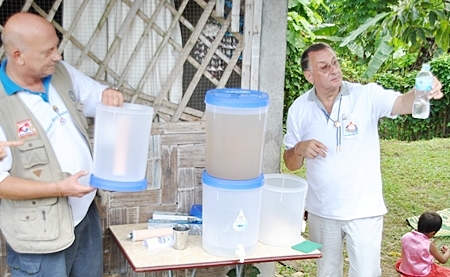 Rotarians Jan Abbink and President Carl Dyson demonstrate the simplicity of the drip filters and the purity of the filtered water. 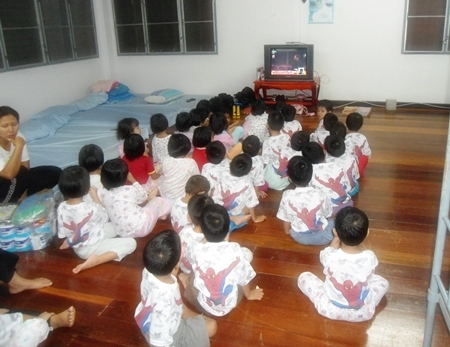 While numerous companies have come to the aid of the children from the Rangsit Babies Home who are all under age 6, Pinya said more aid is needed. Specifically, the shelter needs 10 radio/CD players to use in teaching, three 20-inch fans, three trolleys, a Mulinex food processor and hygiene gloves for handling food. Tony Malhotra (2nd left) and Andrew Emerey (right) together with students from St Andrews brought life-saving water filters and Swiss International Air Lines blankets for the children. 160 sets of children’s clothes are also needed for girls and boys, including long sleeved night suits. Other needs include kitchen utensils, washing machines, OLAC baby formula and antibiotics. 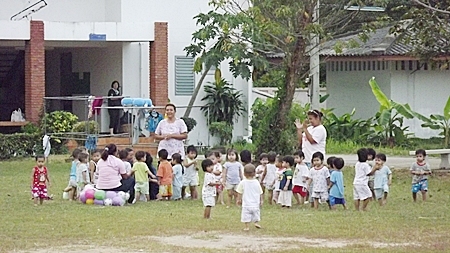 The centre welcomes organizations or private individuals to visit the children and arrange lunches and donations. Telephone numbers are 038-241-072, 084-3213-602.